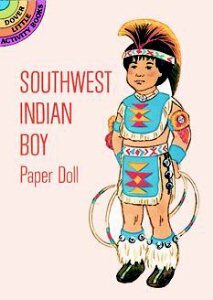 What did Southwest Indians wear? The Pueblo clothing was made mainly from cotton. Animal skin was used for blankets, breechcloths and aprons. Weaving on large looms was done mostly by men. They wove blankets, shirts, robes, aprons, kilts, breechcloths and belts from vegetable fibers, animal and human hair, and cotton they got from trading. Their shoes were sandals, moccasins, and snowshoes. Sandals came in many styles. Necklaces, earrings, bracelets, arm bands, hair combs and pins, were made from wood, bone, shell and stones including turquoise.